Noahpinion: Does the "Entrepreneurship Subculture" prevent big ideas? Does the "Entrepreneurship Subculture" prevent big ideas? Try this: Think of an animal that isn't an elephant. What was the first animal you thought of? For a hefty fraction of you, it was probably an elephant. But if I had just said "Think of an animal", only a few of you would have thought of an elephant. The moral of this story is that when you try to fixate on "thinking different," often you just fixate on the same-old, same-old. The first ideas to be considered during creative idea generation can have profoundly constraining effects on the scope of the ideas that are subsequently generated. Even if initial ideas are intended to serve as helpful examples, or they are given simply to get the creative process going, the constraints of initial ideas may be inescapable. Such constraints can impede successful problem solving and inhibit creative invention. Overcoming these constraints can be enhanced by reconsidering initially failed problems in new contexts. Here is another paper by Smith, along with Nick Kohn, detailing how group brainstorming can lead to "collaborative fixation", in which everyone in the group starts fixating on whatever ideas get suggested first. Why am I bringing this up? Well, in the past few years, I've been reading - and hearing - a lot about the Entrepreneurship Subculture. You all know what this is. It's mostly young people, mostly in urban areas (especially SF and NYC). It's mostly (but not exclusively) made up of entrepreneurs in the fields of technology and media. It includes media outlets like TechCrunch, books like The Lean Startup, "incubators" like YCombinator, forums like Quora, and other outlets like the TED and TEDx talks. I myself have come in contact with this subculture just by dint of being friends with a lot of engineers, and with Peter Chang, whose own venture-funded media startup covers a lot of entrepreneurship-related events out in the Bay Area. At this point, given the often combative nature of this blog, as well as the title, you might expect me to reveal that I am a detractor of the Entrepreneurship Subculture - a hater, so to speak. But that is not the case. I love the Entrepreneurship Subculture. The sheer intellectual energy of the movement is intoxicating. The people are, by and large, wonderful human beings. And the work being done by those involved in the Subculture is some of the most valuable stuff being done anywhere. 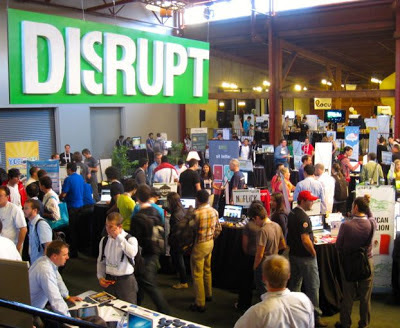 In an age when much of highly-educated white-collar America spends its time performing unnecessary medical tests, trying to trick suckers into buying overvalued financial assets, or lobbying government for pork, the crowd at your local TechCrunch Disrupt conference are the real heroes of the economy. But - as you may expect - I wonder if the Entrepreneurship Subculture isn't creating some unwarranted adverse effects. By putting entrepreneurs in such close and constant contact with each other, does the Subculture ferment creativity and cross-collaboration? Probably. But it also may inadvertently stifle creativity, by exactly the process that Steven Smith's research describes. Working in incubators, attending entrepreneur conferences, reading entrepreneurship publications, and talking constantly to other entrepreneurs may cause "collaborative fixation". Everyone will end up thinking of the same stuff, even if they try to think of something new and differentiated. Especially if they try. If that happens, what we'll see is a lot of "me too" products. A social network for miniature terriers. Yet another mobile social local photo sharing app (that line is plagiarized from somewhere, but I can't remember where). Not the kind of big conceptual breakthroughs that really disrupt the industrial structure. Not the kind of big ideas that build really huge and successful companies. This is important because America needs good entrepreneurship - and especially good tech entrepreneurship - more than ever. Rates of new business formation are falling. The venture capital sector is not making good returns (though much of their profit may have simply been taken by angel investors). And then there is that Great Stagnation. So what is the solution? How can we make sure that a Subculture designed to ferment entrepreneurship doesn't end up accidentally encouraging groupthink? Smith's research suggests a way out: a change of context. Give entrepreneurs a break. Send them out into the wilderness - to other countries, or to small towns away from the beating heart of innovation. Or just encourage them to spend periods of time away from the Subculture, avoiding conferences, not talking to other entrepreneurs, not reading TechCruch. Have them live life, read some science fiction, visit factories and farms and retail outlets and non-tech office parks. Have them talk to friends (or just make friends) who work in other areas of the economy. Get them out of the bubble. Have them write down ideas, keep diaries, etc. I strongly suspect that when they come back, many of them will have new, weird, different ideas that they would not otherwise have had. A famous Japanese artist once told me "It's impossible to think of anything new in a city." I countered "Yes, but it's hard to collaborate out in the country." We agreed that one needs to alternate. In the same way, I think that the Entrepreneurship Subculture should emphasize the importance of changes in context. Disrupt your own ideas. To what extent does this interpretation of the entrepreneurship subculture apply to the economics blogosphere? Not very much. The econ blogosphere is focused primarily on debating and critiquing old ideas, not with coming up with new ones. Which is not to say we're useless, but it's a very different activity. I think you punted on this one. Doesn't the question relate to different varieties of epistemic closure? Nice post. People studying complex adaptive systems (e.g. Dave Snowden) agree that the root of new innovation is cycling people through different contexts. I agree that the output of the "Entrepreneurship Subculture" has gotten very "me too" - but I'd argue that it's not just (or perhaps even majorly) about creativity stifled by context as much as creativity stifled by VC attitudes. Well, maybe so, but I think funding sources are more diverse than just VC. Funding sources are more diverse, but a large majority of the members of the "entrepreneurship subculture" are hoping for VC funding at some stage, even if they currently access a different source - so they orient around the concerns of VCs. You are focusing on a very small category of entrepreneurship. The most successful entrepreneurs I know personally are very good at organizing and managing mundane projects. They are not "big idea" people - but they do accumulate $10 Million to $100 Million in personal wealth. At any given time there are going to be a certain number of opportunities out there and they are likely to have some sort of zipf distribution both as to the capital required and the potential pay-off. Only a very small slice of those opportunities will have the opportunity for a small group, with modest capital, to have a huge pay-off. Trying to be the next Google or Facebook is a mug's game for all but a very few. Yes, that's true. But we need new ideas! At any given time there are going to be a certain number of opportunities out there and they are likely to have some sort of zipf distribution both as to the capital required and the potential pay-off. I agree! But big ideas are more likely to come out of big research labs or government funded research - not garage start-ups. Bell Labs produced the transistor, the charge coupled device, C and Unix. Xerox invented some of the most important technology used by Apple. Even Dell, Google and Facebook grew out of the sheltered environments of college campuses. It's a big mistake to leave engineers and skilled technicians out of the mix, many of whom have fared badly in the U.S. in recent years. As Henry Petrosky put it in his recent book, The Essential Engineer:Why science alone will not solve our global problems', scientists study what is, while engineers create what previously didn't exist, and there is a tremendous amount of cross pollination where engineers create tools that enable scientists to further their understanding, while science feeds the creative process of the engineers to create new markets and technologies. If you look at the decline of such cooperation in the US, such as the loss of Bell Labs, and Corning's abandonment of basic research, it's really sad. In San Francisco, if one wishes to prototype a new device not related to the computer industry, it has become immeasurably more difficult and expensive for a small company or individual entrepreneur to source skilled prototype manufacturers. Thank God (who created software engineers) and CAD software which along with ISO specifications which make it possible to contract these services overseas. However, what is lost is the tremendous amount of design improvement that comes with close active feedback between the design engineer and the fabricators. As a former VP of engineering for Grumman Aerospace once told me, the most creative engineering happens at the first bar outside the plant gate when the engineers and the prototype builders sit down for a beer and discuss ideas they would never dare bring up in front of a management committee. It's worthwhile looking at INET grantee Margaret Levenstein's video at:http://ineteconomics.org/30-ways-be-economist?page=2 I don't think she places enough emphasis on the support network of technologists, but her comments about how capital fled to the financial sector and the loss of industry leadership are very relevant to our current situation. Did you know that around 1920 Cleveland, Ohio, had a technological cutting edge not unlike Silicon Valley today? Probably you didn't, because Cleveland lost its edge during the Great Depression, and its innovation networks were never heard of again. Margaret Levenstein tells the story how, in the late 1920s, local investors who used to fund local inventors started speculating in New York instead, and the innovation networks broke down. This is not a story only about Cleveland, Ohio. This is painstaking research yielding a unique relational database to answer questions about the long-term costs of macroeconomic instability -- this is new economic thinking. "The moral of this story is that when you try to fixate on "thinking different," often you just fixate on the same-old, same-old." Hence the brilliance of Apple's "Think Different" ad campaign. It doesn't make you think differently at all. It makes you think just like every other Apple Fanboy, which is precisely what Apple wants. Taken to extremes this implies that the internet (especially on mobile phones) is stifling innovation, and not just because of superstar effects. It's becoming more costly to be disconnected than to be connected. That's what Neal Stephenson has been saying, certainly. Er, I should have said invention, not innovation. Herding is inevitable. I think the new economy stuff is really valuable not because anything particularly new is actually happening, but because we are beginning to realize the source of innovation is collaborative information sharing. In that sense growth is not just *now* dependent on a collective action problem, but always has been. I agree with Absolon, and then adding to it. I think the VC mindset than an idea needs to be able to be a $100 million company discourages people from pursuing ideas that may be a perfectly great opportunity for the entrepreneur, just a little smaller. A $20 million company is just fine, thank you very much, for most people and it just may not be the best for traditional venture capital. Granted, I am not focused on start-ups, but I am focused on investing in companies that are great, profitable companies but are not likely to fit the criteria for VC because they will not be the next Google or Apple. This could actually be said about a few industries, I think. Certainly media and finance. Having them all clustered is good in one sense but it tends to lead to an internal circulation of ideas, and a loss of understanding about what the rest of humanity is concerned with. From (I think correct) personal experience, the media seems to be reporting more and more about the media these days. In the case of finance it may be more dangerous, since somewhat unsupported ideas emerge (efficient market hypothesis or whatever) and then get completely dominant. You would need to be a fairly strong personality to disagree with the central narrative in your industry, and even if you actively bet against it, and you're right, you still have to push hard against the headwind of those who buy into it. Old man buffett is sitting out there in Omaha allegedly without even so much as a blackberry bold and he seems to have made good. I should tell you that the fixation is enforced, in various ways; hiring practices come to mind. It's an old joke about software jobs that postings will require, e.g., 5 years of experience with a technology that has only existed for 2 or 3 years. I figured as much but I wanted to get the points out there about the 'average' entrepreneur for the sake of most readers. We run in to a fair amount of people who just haven't received much exposure outside of a couple of news articles about Silicon Valley or Boston or NYC. I can really appreciate this post, I've seen both sides of the spectrum in my hometown. The people who identify with the entrepreneurship culture here often form a clique of sorts and are hesitant to let new people and ideas in. I feel like young entrepreneurs forget that there are good ideas everywhere and that ignoring any opportunity or idea is closed minded and unproductive. An example for me was the recent startup weekend we had here. Only the ideas that had been previously known by the "in" got chosen to move on beyond the pitch. What do you think is the best way to combat this "who you know" kind of mentality? one question comes into my mind : nevertheless, ideas will change (including young entrepreneurs and not because they get oder).Why or How? A last one, about econ blogosphere: you wrote "The econ blogosphere is focused primarily on debating and critiquing old ideas, not with coming up with new ones". But to criticize, isn't it necessary to appeal to new ideas, even to create some? same is true of hedge funds. they all go to the same conferences and read the same research which leads to herd mentality. you wont hear about a hedge fund pursuing a novel idea, until its too late and its a crowded trade. New ideas can come from serendipity. This may occur in the process of rigorous scientific research or insights from observations made by experts in one field who see something that can be applied in another. Sometimes these insights occur to lay people who take an observation and see it's application in another field. See the movie "Made in China" (description at http://en.wikipedia.org/wiki/Made_in_China_%28film%29)about one inventor's journey--an inventor who, as the move progresses, describes the source of other inventions. The movie was on my mind because I watched a bit of it just this morning when I was on the treadmill. I've written about the notion that generative ideas stem from felt pressure and opportunities in the environment and from an individual's or team's readiness to be open to learning and new ideas. Entrepreneurship may entail coming up with the idea or taking another's idea, but in the end, it is making something of the idea--commercializing it, producing it, making it happen. "Made in China" shows how difficult this can be even for mere novelty items. Our university and national labs are filled with patents sitting on the shelf just waiting for entrepreneurs to see novel applications and do the grunt work necessary to make something of them.